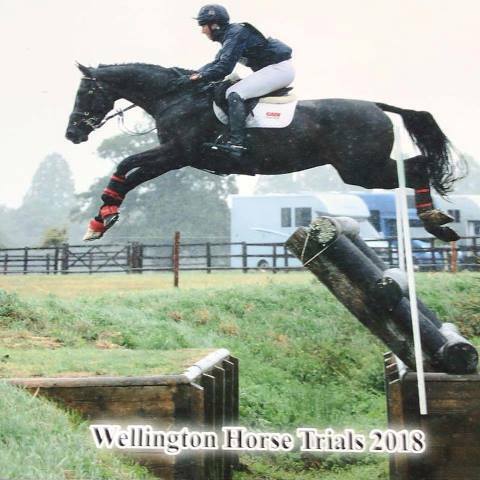 What a fantastic weekend we had at Wellington – despite needing those boots from start to finish on Day 2. With six double clears we brought home lots of ribbons, and the SJ commentators offered David a frequent flyer Gold Card for the number of times he appeared in the arena. We set off on Saturday as dawn was breaking, with four youngsters on the lorry. Four fabulous double clears later we had a 2nd (Granito DHI), 3rd (Reybridge Riverdanz), 4th (Reybridge River Congo) and 10th (Royal Crusade). All four had good dressage scores and less than a handful of time faults XC between them, and David was delighted with their performances. Sunday’s timetable was slightly more reasonable with an 11am start in the Intermediate sections. It was however pouring with rain, as you can see from this picture of Galileo, and didn’t stop all day, His 30 dressage put him in the lead and with one of only four clears SJ and clear XC within the time he held onto the top spot. An excellent win for this 7yo at only his second Intermediate. Droughtville Mike (Eclipse) also ran double clear to finish 3rd in his section, and Christine Lees’ Ferro Point finished in 13th with a really unlucky pole. Fantastic going all weekend despite the downpour and a generally very well organised event – thank you Wellington for a wonderful time.